If you want to pay by following cryptocurrencies (Dash, Ethereum, Litecoin, Zcash, Ripple) please place the order first then send us request for cryptocurrency address at billing@dailysender.com. We will send you address where you will have to send cryptocurrency. After successful transfer of cryptocurrency your service will be activated. 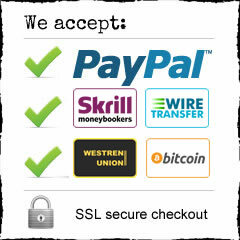 You need to choose payment method of your choice while ordering the account. If you have any questions or you would like to switch your payment method please send us email at billing@dailysender.com. © 2019 Daily Sender. All Rights Reserved.